Tourism in Hamburg has been substantially and continuously growing during the last decade. The city has reached position ten among the most popular European city destinations last year with more than 10 million overnight stays. Even tough the topic of tourism growth is drawing increasing public attention, especially when it comes to spectacular projects like the new concert hall ‘Elbphilharmonie‘ or the plans to build a cable car over the river Elbe, I’ve never come across a good visualization on that issue. Which, at least in my eyes, is quite astonishing, as most of the underlying information like hotel addresses or tourist attractions is space-related. This is where I got started with my just for fun side project. I collected data of hotel locations, categories, years of construction and number of rooms from the free, crowd-sourced database hotelsbase. After quite a lot of data wrangling and searching further details from various hotel- and hotel-booking websites, the only thing missing was information about current building projects. Fortunately there is an up-to-date overview of hotel projects provided by Hamburg travel. 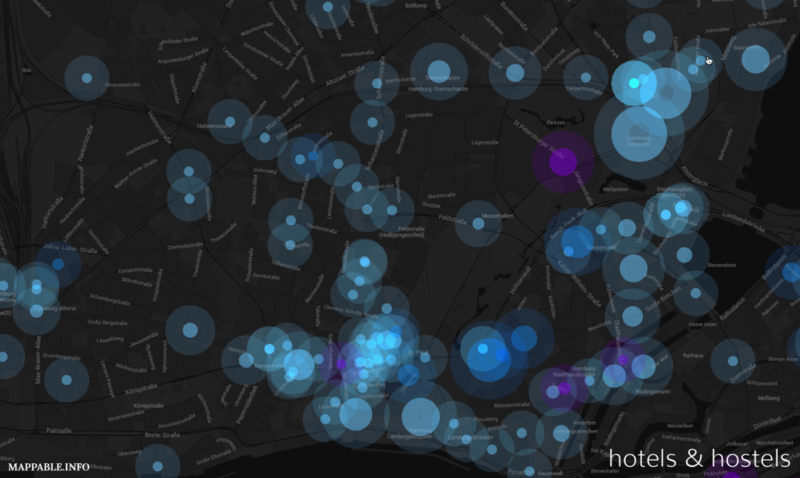 Finally, the fun part about the whole thing was visualizing the collected information by using CartoDB. A really powerful, yet easy to use web-based mapping platform. A big recommendation, even for those of you who are not too familiar with mapping. I started by showing the hotel locations on a dark base-map. In order to visualize the different hotel sizes and years of construction I made further adjustments to the default map style. As a result it is now quite easy to recognize which hotels were built in the last five years (marked in dark blue) and which are currently planned or under construction (purple). You can explore the final and fully interactive map here. Furthermore there is a more in depth analysis of the identified patterns and some additional interpretation (unfortunately only in German). I’m quite curious how people will react to this relatively abstract, but spatial perspective on tourism growth in Hamburg.